Arunachal Pradesh Education Minister Honchum Ngandam on Monday announced scholarship of Rs 75 lakh for 75 IAS aspirants under the Chief Minister UPSC Combined Civil Services Coaching Scheme to ALS IAS Centre at Itanagar. 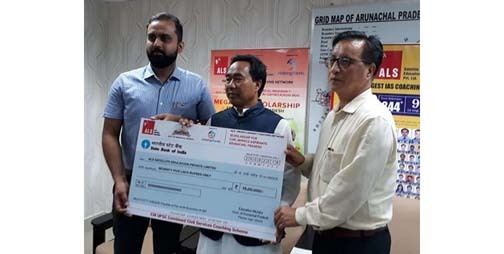 ALS national sales head Prateek Bhattacharya also announced scholarship worth Rs 85 lakh for 225 students by ALS under the ALS CSR initiative for the youth of Arunachal Pradesh. The announcement has created opportunity for 300 talented, needy and deserving IAS aspirants of the State for availing scholarship worth Rs 1.6 crore for UPSC coaching. Ngandam thanked Chief Minister Pema Khandu and ALS for this “path-breaking initiative” and urged the youth to avail of this opportunity and make the State proud in the coming years. Bhattacharya also announced the Mega IAS Scholarship examination to be conducted on September 2 at 11 am in Dera Natung College, Itanagar for selecting 300 talents of Arunachal Pradesh, who would be trained at the centre to compete in the UPSC examination next year. Ngandam said that he would put in a formal request to all MLAs of Arunachal Pradesh to participate in this initiative and sponsor needy and deserving IAS aspirants from their constituencies. Bhattacharya said ALS was confident that with this initiative taken by the State Government and MLAs would reach out to the remotest part of the State and attract top talents who can be trained at ALS IAS Itanagar and produce results from Arunachal Pradesh in civil services in the coming years. He also thanked Helping Hands, an NGO, led by Robin Hibu, Education Secretary Madhu Rani Teotia and Higher and Technical Education Director Tayek Talom for their continuous guidance and support.